Written and compiled by Rev W Derek Weir M.B.E., B.A., B.D. 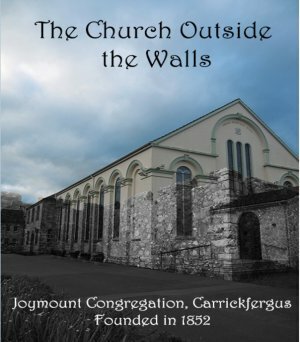 "The Church Outside the Walls"
This is the story of Joymount Presbyterian Church, Carrickfergus from its foundation in 1852 to the present day. The title implies the close proximity of the congregation's property to the town wall and north- east bastion of Carrickfergus, a town in Ulster "steeped in a past of 800 years." It is distinguished for the unique position it has occupied in the religious and political history of Ireland. As recently as 2011, Carrickfergus acquired a wider interest when Her Majesty Queen Elizabeth II conferred upon her grandson, Prince William and his wife Catherine Middleton, the titles of Duke and Duchess of Cambridge, Earl and Countess of Strathearn and Baron and Baroness of Carrickfergus, a title which had lain unused since 1883. The genesis of the congregation was due to the initiative, encouragement and support of the First Carrickfergus (North Street) founded in the early 17th century. Guided by a succession of faithful ministers Joymount Church has adhered to its original aim, i.e. to be ambassadors for Jesus Christ. The author has placed the story of the congregation in the context of the history of Ireland and the Irish Presbyterianism. Also he has endeavoured to record the valued contribuition of the ministers and people to the life of the community of Carrickfergus, past and present. In 2014 the historical importance of the Church property has been enhanced by the transfer to the Knot Garden of the "Burning Bush Memorial" from the Market Place, where it was originally placed in 1992 to mark the 350th anniversary of the organization of Presbyterianism in Ireland. Rev James Warwick G.C. ; Rev Edgar Stewart, B.A. ; Rev. John Young Minford, B.A. ; Rev. Thomas Carlisle, M.A. ; Rev Ronald William Campbell Clements, B.A. Rev T Richard Graham, B.A. is the sixth and present minister of the congregation. He believes that this history will be "cherished by members of the congregation and those who in times past have been members of, or are in some ways associated with Joymount". Moreover he asserts that the Book with provide insight for those "who will follow us in the days to come". "The Church Outside the Walls" is in hardback containing 224 pages and selling at �10.00 per copy. It includes a wide range of black and white and colour photographs illustrating the life of the congregation both past and present.